Juventus won Serie A for the first time since the Calciopoli match-fixing scandal and Manchester City moved closer to a first English title in 44 years. Barcelona's Lionel Messi extended his record La Liga tally to 50 for the season with four goals against Espanyol. There was also a record for German champions Borussia Dortmund who finished the season on 81 points, a Bundesliga best. There were chaotic scenes as Juventus fans invaded the pitch to join the celebrations for a record 28th Serie A title which was clinched with a 2-0 win at Cagliari as AC Milan lost 4-2 to arch-rivals Inter in a stormy derby. Diego Milito scored a hat-trick including two penalties for Inter, who hit back after falling 2-1 behind early in the second half. Mirko Vucinic set Juventus on their way in Trieste, Cagliari's adopted home for the remainder of this season, with a fifth-minute goal and Michele Canini put through his own net in the 74th. Juventus, unbeaten after 37 matches, have 81 points, four clear of Milan. 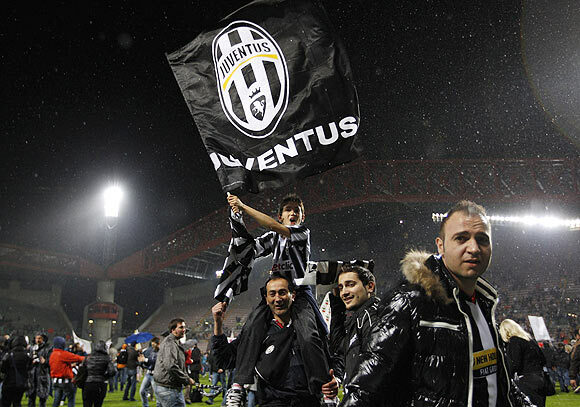 They last won Serie A in 2003, having been stripped of the 2005 and 2006 titles. Yaya Toure scored two late goals to give Manchester City a 2-0 victory at Newcastle United which kept them top of the Premier League standings on goal difference from champions Manchester United with one match left. United beat Swansea City 2-0 but City are eight goals better off than their neighbours and will take the title if they beat Queens Park Rangers at home next Sunday and United fail to defeat Sunderland by at least nine goals. Arsenal stayed third after drawing 3-3 with Norwich City, a point ahead of Tottenham Hotspur who were held 1-1 at Aston Villa. Chelsea won the FA Cup for the fourth time in six years with a 2-1 victory over Liverpool at Wembley. Ramires and Didier Drogba scored the goals for the Champions League finalists to continue Roberto Di Matteo's successful reign as caretaker manager. Messi scored all the goals as Barcelona hammered neighbours Espanyol 4-0 in an emotional last game at the Nou Camp for outgoing coach Pep Guardiola. With Real Madrid sealing their first title in four years mid-week, Messi netted twice from the penalty spot, once with a free kick and once with a low finish into the corner following a thrilling breakaway. The World Player of the Year has scored 72 goals in all competitions this season, also a record, and has four more in the league than Real forward Cristiano Ronaldo, who netted a penalty in his side's 2-1 comeback win at Granada. Jose Mourinho's Real side, who have 97 points with one game left, will break their arch rivals' record for points won in a season of 99 with a victory in their final match at home to Real Mallorca next weekend. Paris St Germain overcame a terrible start in which they conceded two early goals to win 4-3 win at Valenciennes and claim top spot in Ligue 1. Goals by Nene, Maxwell, Blaise Matuidi and Jeremy Menez put Carlo Ancelotti's side on 73 points ahead of Montpellier, who play their game in hand at Stade Rennes on Monday, on goal difference with two matches left. Defending champions Lille, who entertain Caen on Monday, are third on 68 points with three games to play. Olympique Lyon lost any real hope of securing a Champions League spot next season when they were held to a 1-1 home draw by Stade Brest that left them eight points behind Lille. Cologne slipped into the second division as Hertha Berlin grabbed the lifeline of a relegation playoff and champions Borussia Dortmund thumped Freiburg 4-0 to set a Bundesliga season points record. Dortmund, with two goals each from Jakub Blaszczykowski and Robert Lewandowski, finished eight points ahead of Bayern Munich who crushed Cologne 4-1 before their German Cup and Champions League finals this month. Angry Cologne fans lit fires in the stands and briefly stormed the pitch after the final whistle before police pushed them back. Hertha's Anis Ben-Hatira scored twice in their 3-1 win over 10-man Hoffenheim, who had Ryan Babel sent off, and Raffael added another in stoppage time to spark wild celebrations at the Olympic stadium. Champions Porto celebrated their Portugal Premier League title with a 2-0 victory over Sporting, before enjoying the trophy ceremony with the home fans. Brazil winger Hulk, Porto's top marksman in the league, scored both goals. Benfica secured second place and direct access to next season's Champions League thanks to a 1-0 win over Leiria with one round still to go.